Meridian Charter Township is a charter township of Ingham County in the U.S. state of Michigan. As of the 2000 census the township had a population of 39,116. Meridian Township is the local government unit that includes the unincorporated communities and census-designated places of Okemos and Haslett. Meridian Township is the third largest municipality in the Lansing-East Lansing Metropolitan Statistical Area. Meridian Township takes its name from the fact that the Michigan Meridian, the prime north-south survey line runs through the township. It is from this line that all townships were surveyed and measured. Meridian Township was first settled by white pioneers in 1836. In November 1836 Obed Marshall purchased 180 acres (73 ha) of land near present-day Haslett. The earliest settlers located at Pine Lake (now Lake Lansing) and made use of the numerous stands of pines to build their cabin. The lake was later the site of a Spiritualist Meeting Camp led by John Haslett. During the late 19th century, the lake became known as a local vacation area served by an "interurban trolley" which ran from the City of Lansing to the resort on the south side of the lake. An amusement park was introduced and enjoyed immense popularity into the mid-20th century. Currently, the Village of Haslett is located at the south side of Lake Lansing. The first white settlers near the current Village of Okemos (to the south of the former Pine Lake) were Sanford Marsh and his wife who built their cabin in 1839. They were soon followed by Joseph Kilbourne, who took out land for his brother-in-law, Freeman Bray. It was Bray who platted out the southeast corner of his land and sold the lots to newcomers traveling into the mid-state wilderness. The village was first known as Hamilton. A post-office called Sanford was established in the spring of 1840. Joseph H. Kilbourne was the first postmaster. A local Native American, Chief John Okemos, was well-known throughout the area. The village area was one of his primary camping areas and he traveled frequently between the village and another campsite near present-day Portland, Michigan. In 1857 the Michigan Legislature changed the name of the village officially to Okemos to honor the old chief. The Township is rich with history and one resident, Joseph Kilbourne, had a major role in the decision in 1847 to relocate the state capitol from Detroit to Lansing (then Lansing Township). A local organization, the Friends of Historic Meridian, has an archive of local historic information and also maintains the historic buildings in the Meridian Historical Village. According to the United States Census Bureau, the township has a total area of 31.8 square miles (82.3 km²), of which, 31.0 square miles (80.3 km²) of it is land and 0.8 square miles (2.0 km²) of it (2.42%) is water. As of the census of 2000, there were 39,116 people, 16,414 households, and 9,782 families residing in the township. The population density was 1,261.2 per square mile (487.0/km²). There were 17,120 housing units at an average density of 552.0 per square mile (213.2/km²). The racial makeup of the township was 86.36% White, 4.05% African American, 0.32% Native American, 6.51% Asian, 0.05% Pacific Islander, 0.69% from other races, and 2.01% from two or more races. Hispanic or Latino of any race were 2.53% of the population. There were 16,414 households out of which 30.2% had children under the age of 18 living with them, 48.9% were married couples living together, 8.2% had a female householder with no husband present, and 40.4% were non-families. 29.1% of all households were made up of individuals and 6.8% had someone living alone who was 65 years of age or older. The average household size was 2.36 and the average family size was 2.99. In the township the population was spread out with 23.7% under the age of 18, 13.4% from 18 to 24, 27.5% from 25 to 44, 25.4% from 45 to 64, and 10.0% who were 65 years of age or older. The median age was 35 years. For every 100 females there were 91.5 males. For every 100 females age 18 and over, there were 87.6 males. The median income for a household in the township was $55,203, and the median income for a family was $80,114. Males had a median income of $55,705 versus $39,306 for females. The per capita income for the township was $32,190. About 4.3% of families and 9.4% of the population were below the poverty line, including 6.9% of those under age 18 and 3.8% of those age 65 or over. ^ Raphael, Evelyn Huber (1975). A History of the Haslett-Lake Lansing Area, Meridian Township, Ingham County, Michigan. INCO Graphics, Mason, Michigan. pp. 8–9. ^ a b c d Durant, Samuel W. (1880). 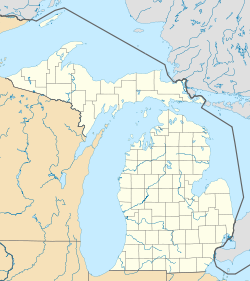 History of Ingham and Eaton Counties, Michigan. D.W. Ensign & Co., Philadelphia. This page uses content from the English language Wikipedia. The original content was at Meridian Charter Township, Michigan. The list of authors can be seen in the page history. As with this Familypedia wiki, the content of Wikipedia is available under the Creative Commons License.